Drug checking is an evidence-informed harm reduction measure that allows people to check what’s in their drugs. 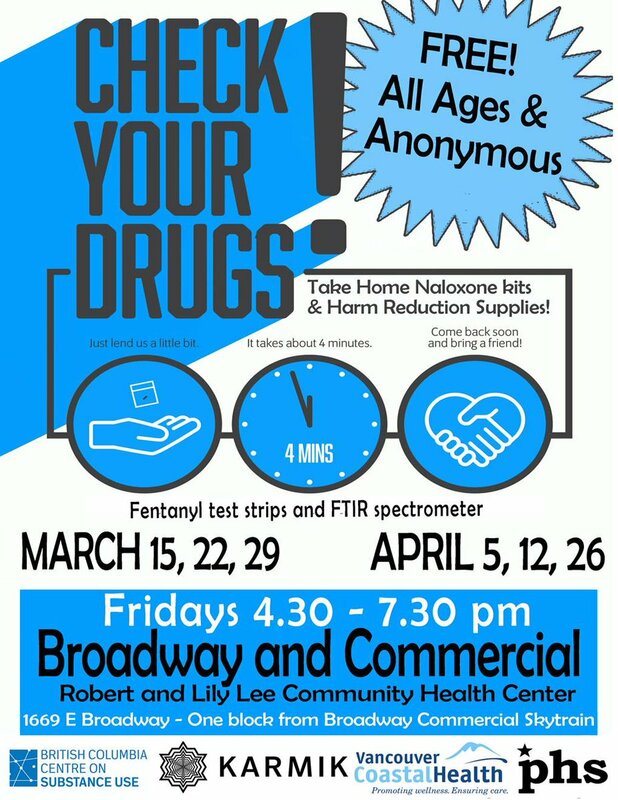 Many drugs bought on the street do not contain the substances people expect and may be contain harmful and even deadly contaminants, such as fentanyl. In partnership with regional health authorities, local community agencies, and various levels of government, the BC Centre on Substance Use (BCCSU) is offering anonymous, free drug checking at select locations across British Columbia. This service can test a range of substances, including opioids, stimulants, and other psychoactive drugs such as MDMA. Results are usually available in fewer than 10 minutes. Drug checking through the BCCSU pairs the use of a Fourier Transform Infrared (FTIR) spectrometer with fentanyl immunoassay strip testing. The FTIR can rapidly and accurately identify a wide range of compounds present in a sample, and the immunoassay strips are able to detect even trace amounts of fentanyl and some analogues. Clients also have the option to submit a small sample for laboratory-based testing. Samples will be transferred to one of a laboratory partner to provide confirmatory testing to ensure the accuracy of results. The results will be posted here on a regular basis. This work is made possible through funding from Health Canada’s Substance Use and Addiction Program, the City of Vancouver, and the Vancouver Foundation. We gratefully acknowledge the contributions of our partners, Vancouver Coastal Health, Interior Health and Fraser Health. To learn more about drug checking, please contact us. Thursday 10:30 a.m. – 5:00 p.m.
Fridays 4:30 p.m. - 7:30 p.m. The BCCSU is evaluating how this drug checking may help people make informed decisions about substance use while providing valuable drug surveillance data to increase the public awareness about what’s in the drug supply. Each month, the BCCSU provides reports to provincial health authorities summarizing key indicators for the Fourier Transform Infrared (FT-IR)/fentanyl test strip combination drug checking. This report of drug checking as a harm reduction intervention includes an evidence review of the different kinds of technologies that can be used for drug checking. This manual offers basic instruction on the drug checking procedures, protocols, and methods used by the BCCSU drug checking program and is intended to supplement (not substitute) in-person training.